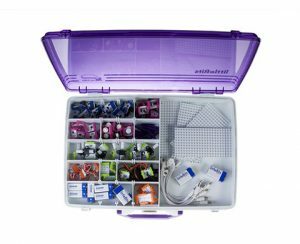 LittleBits has been created to be used by everyone, regardless of age. Since people pick up technology at different paces, littleBits is designed so everyone can learn at their own speed. That’s why it’s used at every level of education, from elementary school all the way up to university and beyond. 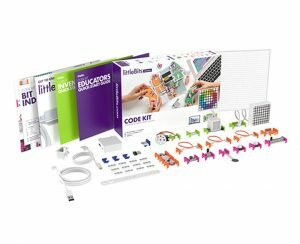 littleBits makes technology kits that are fun, easy-to-use, and infinitely creative. The vkits are composed of electronic building blocks that are colour-coded, magnetic, and make complex technology simple and fun. Together they’re interchangeable in millions of different ways to empower kids to invent anything – from a sibling alarm, to a wireless robot, to a digital instrument. The Bits snap together with magnets, no soldering, no wiring, no programming needed. The secret to learning? Make. It. Fun. So this kit’s all about learning to build & code through games. With games, students embrace failure, make their own rules, think critically, and collaborate. 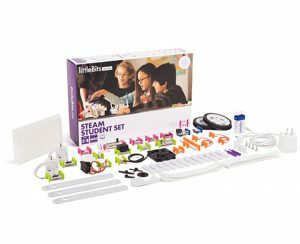 The littleBits STEAM Student Kit is the easiest way to integrate powerful STEM/STEAM learning into the classroom. Designed with educators, the toolbox engages students in learning through creating inventions while linking to NGSS/Common Core standards. The new and improved Workshop Set is here, arming your classroom or makerspace with all the Bits you need to unleash creativity and get individuals and groups creating inventions. With 160 Bits (8 sets of 20 user favourites) and multiple accessories, this Workshop Set is gigantic! 4+ hands-on inventions – Comes with everything students need to build & code 4 fun games (including hot potato and tug-of-war), then get creative and invent their own! Simple drag-and-drop code – The computer-based Code Kit app provides step-by-step instructions for easy, intuitive block-based programming. 16 Bits, 30+ accessories, tons of resources & a computer-based Code Kit app. 100+ activities & 10 lessons. 8 of the following bits: Buttons, Buzzers, DC Motors (tethered), Forks, Latches, Long LEDs, Power Modules, Pulse Modules, Servos, Fans, Inverters, Light Sensors, Numbers, Pressure Sensor, RGB LEDs, Slide Dimmers, Thresholds. Looking to order a Littblebits Kit?